I think that I have figured out what is bringing back deleted items, they came back again today. Because of the length of time these programs have been taking I have been running them over night, and have been cancelling by Nero back me up runs, I have been manually saving my most critical files. Last night is the first time I allowed the backup to run because the Zoek program finished before I went to bed, and now the deleted files have re appeared. I will uninstall The Nero programs tonight, and reinstall, unless you can recommend another backup program. Tool run by Hightorque UK on 01/04/2014 at 8:42:14.14. Well that makes sense. I'm assuming that the Nero backup program was working correctly in the past. Do you know what changes were made to the program just before the issue with the files reappearing started? If it was an update or another module of the program that you installed you can try uninstalling them and see if that resolves the issue. You should also be able to go to the Nero support site and ask them for assistance. As for a different backup program, that would be a question for one of the Techs. I'll ask them if you decide that you don't want to ask Nero for assistance. Meant to mention last time. I have deleted the side bar as suggested. I had an update to Nero about 4/5 weeks ago, could be that was about the time I started having problems with deletions. 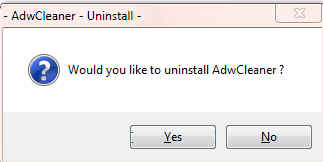 Have uninstalled Nero which has taken out all the original programs, and reinstalled the latest version. We will see what happens tomorrow. It looks like this is about the last issue to be fixed. I will let you know by Friday about the deleted files. Want to give it a few days. Gave it a few days before I checked back. I have found that if a Nero Backup Sync program aborts for any reason, the deleted files reappear. I have now stopped the sync programs. No reappearance of deleted files after 10 restarts. You are more than welcome. I don't live near IL, but when I open my next beer...that would be a little later today...I'll think of you. I'm glad you were able to track the culprit to Nero Backup Sync. I am assuming that you no longer need help from rshaffer61 in the Applications forum. If that is the case please put a reply in the topic in the Application forum letting him know that we found the problem in the Malware removal and I will send him a note also. Let's check for programs that need to be updated and after that is done we will be ready to clean up our tools if you don't have any further issues. Download Security Check from here or here and save it to the Desktop. 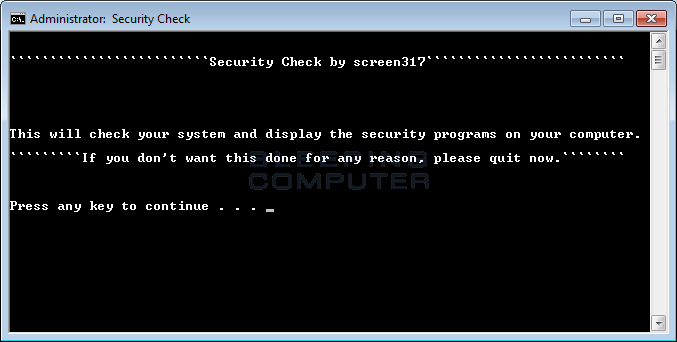 Right click the SecurityCheck icon and click Run as Administrator to run the application. Allow any UAC warnings. Adobe Reader 10.1.9 Adobe Reader out of Date! Let's defragment that hard drive. this will put most of the files in contiguous data blocks. The hard disk won't have to access so many places when opening a program of calling up a data file. That will result in less wear and tear on the hard disk and in theory speed up the time it takes the hard drive to access those programs or files. After this we will update programs. Look for cmd.exe in the Programs list and select Run as Administrator. Click on Continue at the UAC prompt. The Command window will open. Let me know when this has finished and we will update programs. I do not understand why the fragmentation was so high before, my defrag runs once a week, last run on Wed last week. SecurityCheck may have posted a false reading, or it may have included the files that are locked in areas of the hard drive and can't be moved in it's calculations. Either way your system reports 0% fragmentation, so I wouldn't worry about it. Let's update programs and then I swear we'll be ready to clean up. Your IE is out of date. Even though IE11 is out, the latest version that Vista can update to is IE9 so you may want to leave it alone if you don't use IE as your default browser. As in the risk of breaking something in IE during the upgade might outweigh the benefits of the newer version. It's not supposed to happen, but it does on occasion. Please click here to go to the Microsoft IE9 download page. IMPORTANT!! Before you click the Download Internet Explorer 9 button, uncheck the box next to: I would also like Bing and MSN defaults unless you want Bing to be the default search engine and MSN to be the default home page. Click the Download Internet Explorer 9 button and download the setup file to the desktop. Once the setup file has been saved to the desktop, close the browser and all other open programs. Right click the setup file and click Run as Administrstor to install the new version or IE. Earlier versions of Adobe Reader have known security flaws so it is recommended that you update your copy. Re-boot your computer as required. Once ALL versions of Adobe Reader have been uninstalled, download the latest version of Adobe Reader from Here. Remove the check mark next to Yes, install McAfee Security Scan Plus-optional box. Click the Download Now button to download Adobe Reader and follow the directions. Alternative Option: After uninstalling Adobe Reader, you could try installing Foxit Reader from HERE. Foxit Reader is a much smaller program. It has fewer add-ons therefore loads more quickly. 1. Let me know how the updates went. Adobe Reader unistalled, tried to download and install Foxit Reader, when I went to open the exe program nothing happened and the program icon disappeared, downloaded 3 times, same problem. So I have installed the new Adobe Reader. You will get a Disk Cleanup confirmation asking if you are sure you wan to delete the files. My OTL.exe file has disappeared. Should I download it again and run the command ?? If so please give me the link to the file. Yes, download the OTL program and save it to the folder where you ran the old OTL program from, the C:\Users\Hightorque UK\Downloads folder. That should be where the OTL log files are. Then run OTL and click the CleanUp button. Click here to download OTL. Do you ever sleep ???? ?